Sometimes when you scroll EUCAP Somalia’s web page or social media sites, you may get the impression that there are training courses one after another; they just keep on coming. But it’s not that simple as courses are thoroughly planned and evaluated so that the Mission can develop even better training courses and support the Somali authorities in maritime capacity building in the most effective way. For these purposes, EUCAP facilitated, in cooperation with Somaliland Coast Guard, an Evaluation Workshop in Hargeisa. The Evaluation Workshop on 14 November, was the final event of the Law Enforcement Training Project. 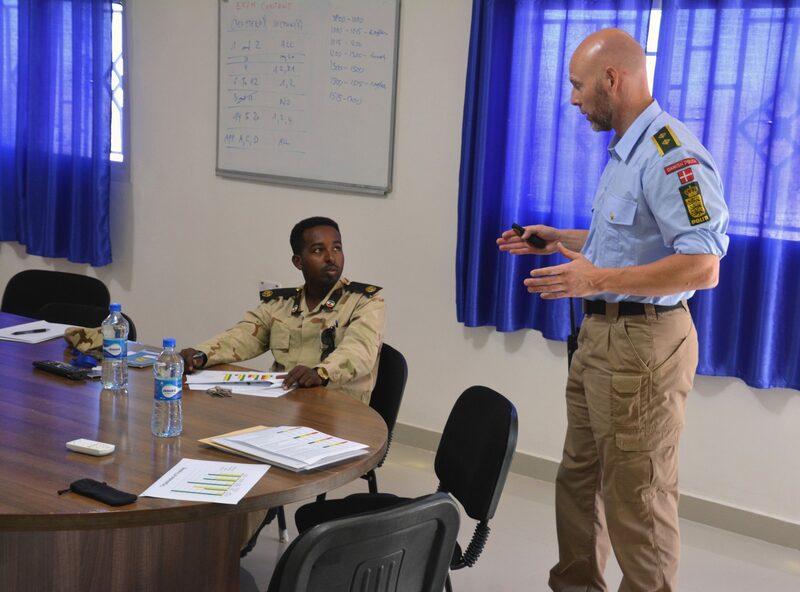 The Workshop brought together the trainers and organizers as Colonel Ibrahim Abdi from Somaliland Police and Major Khadar Mohamed from Somaliland Coast Guard (SLCG) attended with Coastal Policing Adviser Frank Hedegaard Madsen from EUCAP. Mr. Ali Mohamed Ali from Attorney General Office participated to evaluation via phone and emails. The purpose of the workshops was to evaluate the Basic Law Enforcement Training Course and identify any possible problem areas in order to improve future trainings. 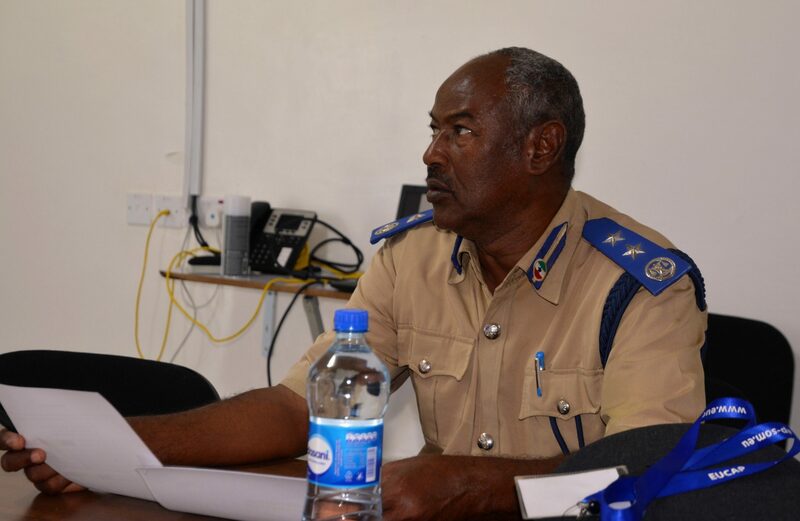 Based on the feedback collected from the Somaliland Coast Guard Officers who participated in the Basic Law Enforcement Training Course in Hargeisa on 4-8 November, the trainers and organizers agreed on five areas where improvement is needed: length of course (should be longer), more practical exercises, change of venue, daily schedule and a more detailed agenda. The next step for the officers, who participated in the Basic Law Enforcement Training Course, will be the Intermediate Law Enforcement Training Course where the teaching will go more into details. There will also be more practical training, for instance in how to secure evidence properly. 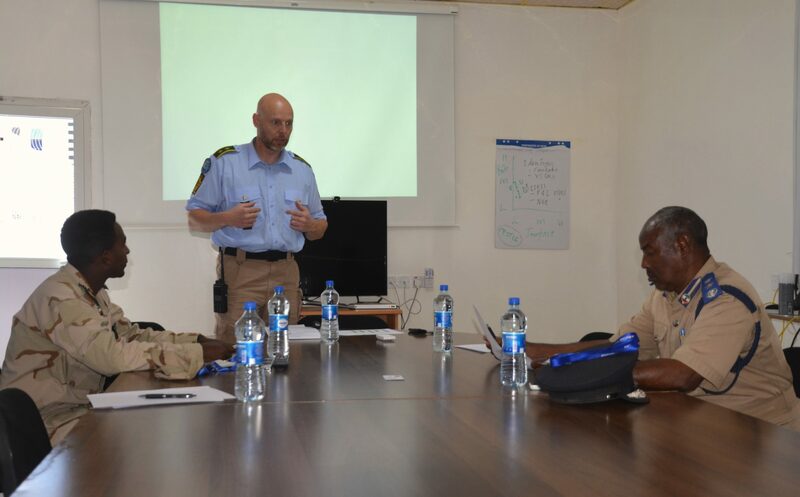 On the other hand, as Coastal Policing Adviser Frank Hedegaard Madsen noted, in the future the Basic Law Enforcement Training Course should be offered to the officers at the Coast Guard Base in Berbera since this will be the initial point of operation for the boats donated by Sweden. “Although enhancing the operational capabilities of the Coast Guard is a priority, the Law Enforcement Training Project also focused on local ownership and self-sustainability. That is why utilizing local expertise for the training as well as building a Training Department within the Coast Guard is of importance”, states EUCAP’s Frank Hedegaard Madsen.